I’m a day late, but I hope that you all had better things to do on Valentine’s Day than check my blog and wonder why I hadn’t updated. I told Théo not to get me anything for Valentine’s Day because I’m not that big a fan of Valentine’s Day gifts unless they contain glitter. This could also be because I have a long and glorious tradition of being sick on Valentine’s Day and mentally associate it with viruses. I didn’t have a horrible cold or the flu for this one! Although I did have a doctor’s appointment for my lupus, so I don’t know if that c0unts. Théo came with me and amused me with the Valentine’s Day messages section in the newspaper. 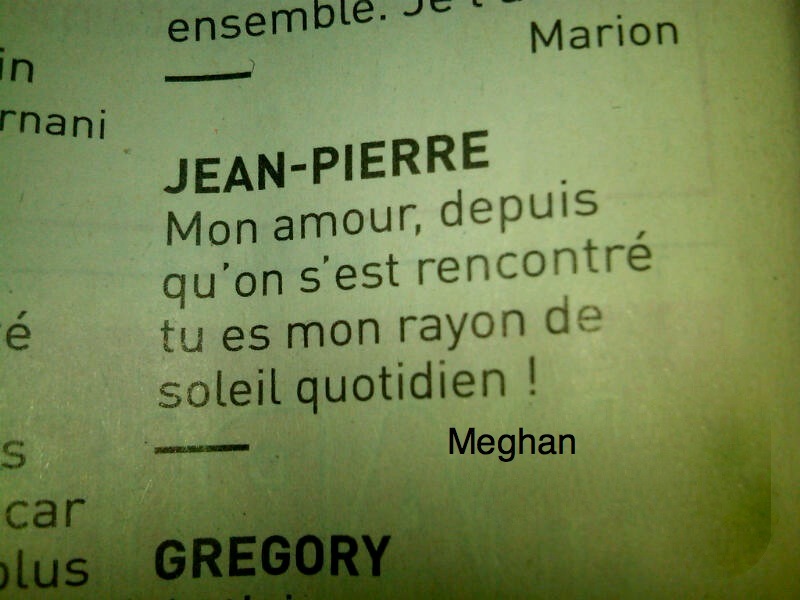 Thing I learned: the average French person is just as bad at writing sappy love messages as the average American person. Some people might suggest that this picture has been photo-shopped and that the original ad was from some woman named Christine who was talking to a real man and not a green, VW bug. Those people would be wrong. Théo: Maybe? Do you have any ideas? Meghan: I don’t know… I’m not really good at being a girl. Maybe you should ask Annuli to help; she’s a real girl. This is why I don’t like people buying me things for Valentine’s Day. I don’t even know what to get me for Valentine’s Day. Besides pain au chocolat, which Théo DID buy for me. He also got me a drink, so I think that counts. I just realized I didn’t get him anything. Who wants to send me glitter so that I can make an obnoxious, heart-shaped card for him with poorly written French poetry (that I may or may not be stealing word-for-word from the newspaper ads from yesterday)? I know that’s what every guy wants to get for Valentine’s Day so he can show it to all his friends. This is probably why God makes sure I’m sick every Valentine’s Day… so that my boyfriends don’t die of embarrassment at their glitter cards. ← If you’re the person who stole the pains au chocolat from my bakery, read no further. Um, I think it says you’re an English major. Just sayin’. So is it horrifying that I jump into these things with such gusto? I plot and connive, even if all I’m actually doing is giving him a card. I printed little cut-outs at work, the kind you’d give out in elementary school, and hid them for Joe to find. And I made muffins, but not because it was Valentine’s Day. I was just hungry. But I do this at every special occasion, Christmas, birthdays, etc. I’m such a sap. If it makes you feel any better, I am also often sick at Valentine’s Day! I was supposed to even have a francophone soiree tonight and prepared valentines for everyone with french quotes about love and what have you … didn’t happen! I’ve had a look at your blog a few times and have really enjoyed it! How much longer will you be in Paris? I lived there for a year, and lived in Geneva for 12 years, Avignon for 3 months and always tried to do long week-ends or vacations in the Southern part of France. I loved living in Europe and immersing myself in the French language and cultures. I’m back in the States, doing a PhD in francophone lit. Have a peek at my blog if you’d like. From time to time, I write on a francophone topic. I haven’t yet figured out how to follow your blog automatically … I will figure it out, I’m sure! Soigne-toi bien et profite de Paris!! Monsieur Garden et moi avons survecus a plusieurs decennies de NON Saint Valentin. Nous n’avons jamais fete la Saint Valentin. Je trouve qu’un pain au chocolat, mais tu dois dire : “une chocolatine” est un cadeau merveilleux.